I started the bank holiday weekend a bit early and yesterday visited Pevensey Castle where I enjoyed roaming around while it was still peaceful before the holiday crowds descended on the Sussex coast. The castle, which was originally built in Roman times, used to be right on the edge of the sea, but is now a mile or two inland. According to the audio guide I was loaned during my visit, the castle was at one time the prison of Joan of Navarre, who was accused of witchcraft. Joan became Queen Consort of England when she married King Henry IV in 1403. They had no children, but during his life she got on well with his children from his first marriage, often taking the side of the future Henry V, "Prince Hal," in his quarrels with his father. But, during the reign of Henry V, she was accused of using witchcraft to try to poison him. She was convicted in 1419 and imprisoned for about four years in Pevensey Castle. The photo to the right shows the tower and oubliette where noble prisoners including Joan were incarcerated. After her release, she lived at Nottingham Castle and was eventually buried in Canterbury Cathedral next to Henry IV. 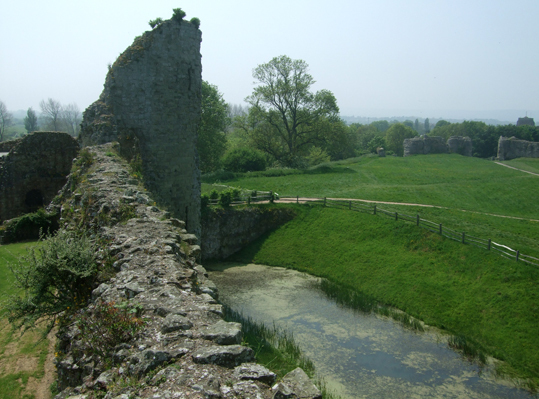 However, the fact that she died a long way from Pevensey Castle hasn't stopped some speculating that the ghostly figure sometimes seen wandering the battlements is in fact Joan, the woman suspected of being the witch-queen of England. 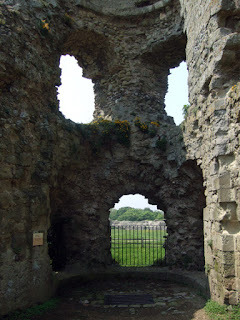 Pevensey Castle is managed by English Heritage.